Many Thanks to the Ministry of Transportation for the information contained in this report. Highway 97 The Okanagan Highway is a 269 km (167 mi) long section of Highway 97 between the international border and Monte Creek on the Trans-Canada Highway. It is named for the Okanagan region of British Columbia, through which it largely passes. It begins in the south at the international border crossing north of Oroville, and travels 4 km (2½ mi) north to its junction with the Crowsnest Highway at Osoyoos. The highway travels north for 47 km (29 mi), passing through the community of Oliver, before arriving at the locality of Kaleden, where Highway 3A diverges west. 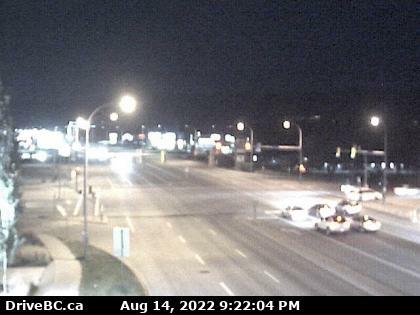 13 km (8 mi) north of Kaleden, Highway 97 arrives at the city of Penticton. North of Penticton, Highway 97 follows the western shore of Okanagan Lake for 45 km (28 mi), through the communities of Summerland and Peachland, before reaching its junction with Highway 97C just south of Westbank. From there, Highway 97 passes through West Kelowna, Westbank, Lakeview, and reserve lands belonging to the Westbank First Nation until, 15 km (9 mi) northeast of the 97C junction, Highway 97 begins to cross Okanagan Lake via the William R. Bennett Bridge. The highway enters the city of Kelowna upon landfall on the east shore of the lake. 6 km (4 mi) east into the city centre, the highway reaches its junction with Highway 33. Four kilometres (2½ mi) north of the Highway 33 junction, Highway 97 leaves the urbanised area of Kelowna (the municipal boundary is actually a further 12 km, 7 mi, north). For the next 43 km (27 mi), the route travels well east of Okanagan Lake, passing through the community of Winfield, then alongside the west shore of Wood Lake to Oyama. Both of these communities lie within the municipality of Lake Country. Highway 97 then passes along the west shore of Kalamalka Lake before entering the city of Vernon and a junction with Highway 6. The highway then travels north for 10 km (6 mi) to a junction with Highway 97A at Swan Lake, at which point it veers northwest. 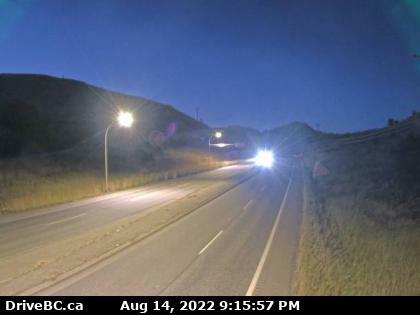 81 km (17 mi) further, Highway 97 merges onto the Trans-Canada Highway at Monte Creek, following Highway 1 for 105 km (65 mi) west to Cache Creek. As it travels westward, Highways 1 and 97 parallel the Thompson River, passing through the city of Kamloops, where there are junctions with Highways 5 and 5A. Highway 33 is a minor two-lane highway in the Okanagan region of the province. 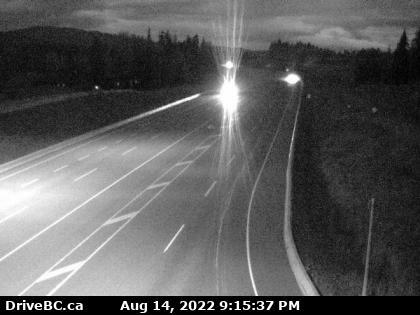 Highway 33, which is 129 km (80 mi) long, connects Rock Creek, on the Crowsnest Highway, north to Kelowna, ( Kelowna Cam )on the Okanagan Highway, partially following the West Kettle River. It is also the main access to the Big White Ski Resort. The only other visible community on Highway 33 is Beaverdell, 48 km (30 mi) north of Rock Creek. Highway 33 opened in 1970. All Season vs. Snow tires Which do you need? 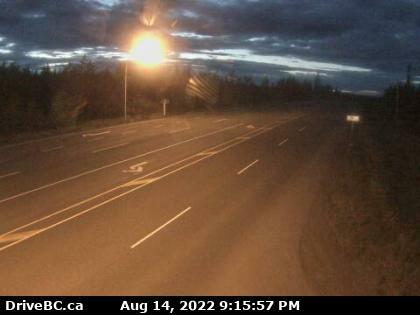 Hwy 97, 10.5km South of Quesnel, looking north. 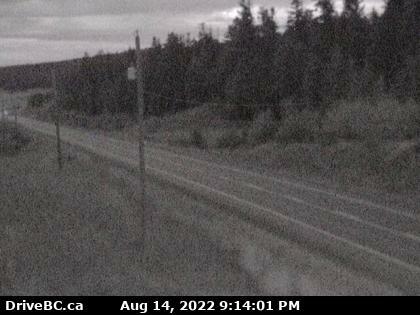 Hwy 97, 37km south of Williams Lake, looking north. 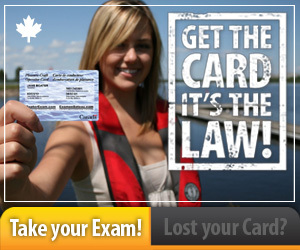 Get Your Boating License — It‘s The Law!